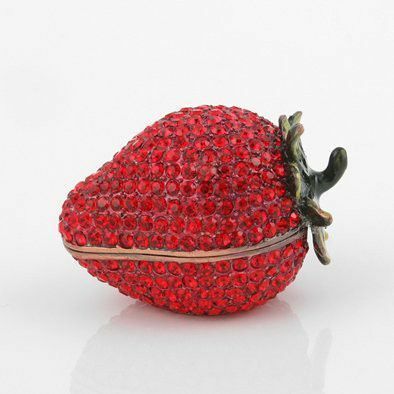 This cute strawberry trinket box is encrusted with several Austrian crystals. 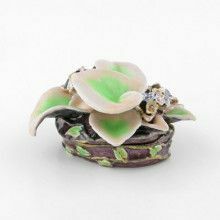 The majestic Faberge style trinket box is constructed from a pewter base so that it will never tip over. 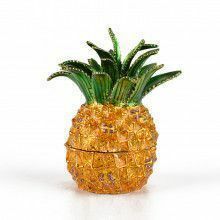 The box opens with ease and closes securely thanks to a magnetic clasp. 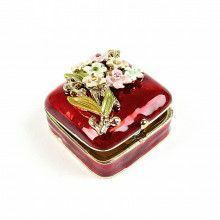 These beautiful keepsake boxes are similar in style to the jewelry boxes made famous by 19th century jeweler Carl Faberge, whose jewelry boxes are world renowned. 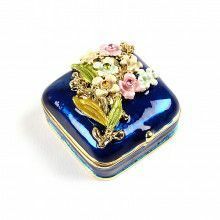 Many of Faberge boxes were enameled, and set with crystals just like these trinket boxes. His boxes were even displayed by members of the Romanov Dynasty.